Tapes used to be the standard backup medium, but the process of spooling forward or backward to reach information can take days. 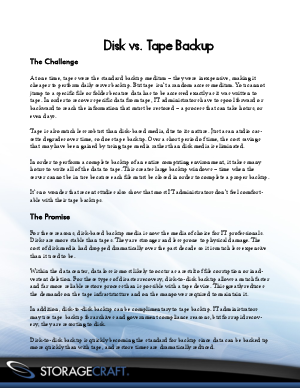 Disk-based backup media is now the choice for IT professionals - they are stronger, faster, and less prone to physical damage. StorageCraft® ShadowProtect® is the award-winning line of disk-based backup and disaster recovery software for Windows servers, desktops and laptops. Find out how you can save time, money, and storage space with ShadowProtect®.